The godlike Darkseid emerges in the 30th century with an ingenious plot to finally conquer the universe in this Deluxe Edition a timeless Legion of Super-Heroes epic! Not only is THE GREAT DARKNESS SAGA collected here for the first time in hardcover, this edition also includes several LEGION OF SUPER-HEROES issues written by Levitz that have never before been collected in any format! 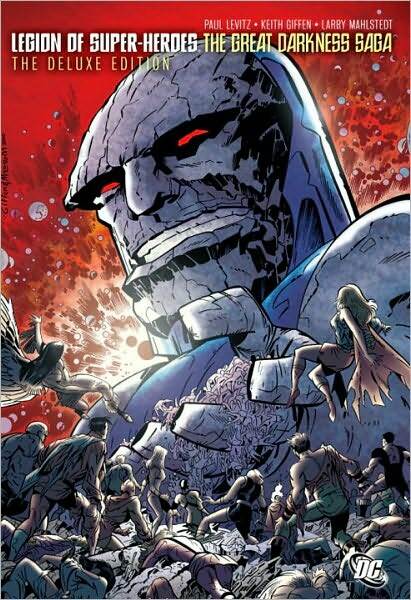 Using his faithful servants to acquire all of the mystic artifacts of the time, Darkseid gains mental control over a race of three billion all-powerful beings. Now, as their universe teeters on the edge of Armageddon, the Legion of Super-Heroes amass their own army of every champion who ever held the status of Legionnaire to stand against the Dark Lord and his invincible soldiers. But as the Legion suffers defeat after defeat, they realize that salvation and victory rest in the hands of a mysterious baby that has aged into adulthood before their very eyes! Although this edition is a “Deluxe Edition”, it isn’t “the perfect edition” because it doesn’t contain the poster by Giffen with its guidelines.